Technology can be completely transformative for insurance companies, a fact industry players already know well. Whether harnessing it to simplify the quote process or exploring artificial intelligence applications for better risk management, modern businesses are taking advantage of what InsureTech has to offer — and it takes smart applications to make sure your company can keep up. Among the latest innovations, blockchain is showing great potential to revolutionize the way insurance providers handle data. The blockchain is in a sweet spot right now to transform from a hot topic in tech circles into commercially viable insurance products in 2018. Essentially a way to encrypt and store a comprehensive log of all data around a particular transaction, blockchain is a natural fit for insurance providers. Even better, that data is only accessible to verified parties and forms an immutable record, helping to protect consumers and cut down on possibilities of claims fraud. Businesses across the spectrum are looking for cost-efficient scenarios to deploy blockchain solutions to take advantage of the cornerstone blockchain properties: data security, transparency, immutability, and decentralization. 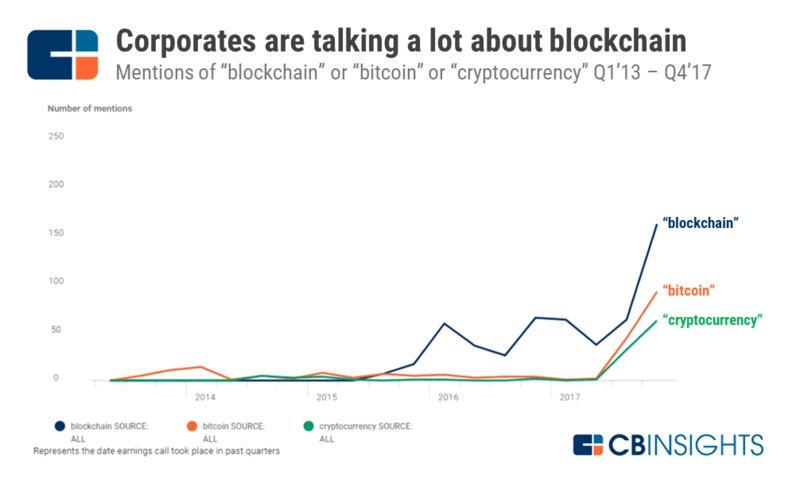 According to CB Insights, the number of “blockchain” mentions in earning calls has skyrocketed since mid-2017. Big players across industries like MasterCard, Visa, IBM, and Overstock have been talking about blockchain for years, and we’re starting to see more and more interesting applications coming to market. Of course, the insurance industry is another that relies heavily on trusted transactions. Big players in software and insurance are paving the way for the blockchain to change the industry, with a number of large initiatives in the past year alone. The time is right for smaller companies to take advantage too and find out how blockchain can totally transform their business model. Last summer IBM, AIG, and Standard Chartered Bank joined their efforts to create the world’s first multinational, blockchain-based insurance policy. To achieve that, they implemented a smart-contract solution with a shared view of policy data and documentation in real time across the UK, U.S., Singapore, and Kenya. The shared digital ledger provides the ability to record and track events and associated payments in each country related to the insurance policy (presented in the form of a smart contract). It takes a consensus from others on the network for any party to modify, delete, or append a record, making it simple to do business across borders. A more recent initiative by IBM, ANZ, and Suncorp in New Zealand in April 2018, tests out the use of distributed ledgers for everything from transferring data efficiently in a multi-party purchase of insurance policies to automated allocation of receipts for bulk payments. The blockchain’s data transparency also allows for greater visibility, reporting, and insights for participants. In 2017, B3i consortium built out a proof of concept for their blockchain ambitions: a distributed smart contract management platform for Property Catastrophe XOL contracts. The platform was piloted by 38 of the consortium's members, and they reported a productivity gain up to 30 percent, saving them time and administration costs. This year B3i is planning to finish the product and release it for reinsurers. And those are just a few examples of blockchain’s potential. Let’s take a look at the most prominent use cases of leveraging the power of blockchain in insurance. The blockchain’s main feature is timestamped, cryptographically secured transactions, which are transparent and available to all blockchain participants. Imagine an open-source blockchain that offers insurers access to verified customer data. This means there is no need to collect and verify customer data manually anymore. The solution could noticeably streamline onboarding for both customers and insurance companies, which allows the latter to cut the costs associated with the onboarding process. With a blockchain solution, the customer can avoid the same routine of submitting personal details every time he or she needs a new policy, and the insurer has direct access to customer information that is up-to-date and trustworthy. At the same time, that personal data does not need to reside in the blockchain. Instead, customers keep their data as digital IDs on personal devices, like their smartphone, and manually grant access to inquiring insurers. IBM’s pilot blockchain project with AIG and Standard Chartered Bank also featured a customized view of policy, payment data, and documentation for third parties: brokers, auditors, and other stakeholders. The approach offers selective visibility to participants based on their credentials, making it easier to share information with brokers or reinsurers and saving them having to reach out to the insurance company. On the blockchain, they have instant access to such verified customer information as name, address, birth, health, and economic status. At the same time, employees from, let’s say, a billing department of an insurance company could have limited access to customer’s name and phone number. Fraud is a big issue in the insurance industry. Inaccurate underwriting information alone amounts to $29 billion a year lost for personal auto insurers, according to a 2017 study by Verisk. The blockchain’s data immutability makes it an ideal anti-fraud platform. All data that gets onto a distributed ledger must be validated by all blockchain participants, and it remains transparent for the insurer. The fact that this data can’t change once it’s on the blockchain is nearly the perfect use case for fraud prevention. In property and casualty claims, it is quite common for insurers and reinsurers to share in the risk. Risk gets distributed across a convoluted web of paper contracts in these cases, with little information shared and practically no transparency. The blockchain adds clarity by providing an equal level of transparency to all stakeholders. All changes in insurance policies get onto the blockchain chronologically; as both insurers’ and reinsurers’ transactions are stored on the blockchain and can’t be altered, there’s a reduced chance that one party will be covering another party’s responsibility during the payout. With traditional insurance relationships, payments can end up crossing borders, which involves intermediary banks, resulting in expensive fees for insurers. Conversely, each payment made via a blockchain is peer-to-peer — directly from one bank to another, eliminating the extra fees associated with intermediary banks’ services. Blockchain can also speed up the process of indemnification, which can often get stalled because it requires a lot of manual verification of facts between brokers, insurers, and reinsurers. With blockchain technology, claims payments can be automated through smart contracts that will hold the coverage information and remove the need for additional reviews by claims adjusters. For insurance companies assessing the chain of events in a claim, it can also be challenging to determine the timeline of incidents leading up to a loss. A blockchain solution pulling data from a trusted Internet-of-Things platform or other established data providers can resolve the uncertainty. A good example is Etherisc — a startup insurance company that helps travelers tackle the risk of a delayed or canceled flight. The company’s solution connects to airports’ info-systems and automatically executes an insurance policy smart contract when there is a problem with a flight. Smart contracts — the essential component of the blockchain technology — will become crucial in InsureTech. Automation of insurance policy sales will allow companies to cut the costs and provide faster and more secure services. Self-administering insurance policies in the form of smart contracts that execute automatically based on reliable data from an immutable ledger, aka blockchain, will let companies reduce the number of intermediaries. This approach could not only speed up the sales cycle but also ensure more accuracy as little to no manual labor will be involved. As you can see, the blockchain has the power to revolutionize the insurance industry. The question is, how can your company leverage this distributed ledger technology and smart contracts? With more than 15 years of custom software development and extensive work in the insurance industry, DOOR3 is uniquely positioned to assist insurance companies with building blockchain-backed solutions, ranging from MVPs to full-featured applications. Our iterative experimentation framework allows organizations to try out new technologies and products and find the best use cases for their business. We can build the evolving application that’s right for you, and the internal, organizational support for those initiatives in a smart and efficient way, helping you stay ahead of the competition, without taxing your budget. The learning curve with breakthrough technologies like the blockchain is often steep. DOOR3 is ready to be your partner in the development of your Blockchain needs and help you find the right solution and applications for your business.